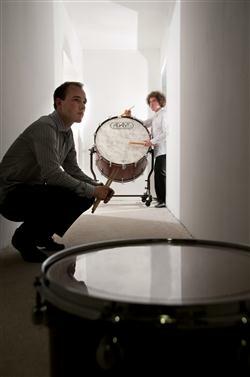 Since 2010, Drumartica organizes a percussion festival XYLODRUM in Ljubljana, Slovenia. The duo members are very active as educators, giving seminars or workshops. An important part of their activity is to commission and perform new music as well as joining different ensembles and orchestras. The duo is not only a concert hall ensemble. They play in many different venues and settings like alternative music venue Metelkova Street in Ljubljana or even more alternative Cadrg Records festival. They played in many different settings such as with a popular band Melodrom in an original mixture of rock band and percussion duo and as soloists with Wind Orchestra. Drumartica cooperates with Mini Musik children's concerts cycle in Munich and with new music festival Slowind in Ljubljana, Slovenia. Drumartica’s Simon Klavžar and Jože Bogolin recently performed an unusual concert on the roof of a mountain hut (bed and breakfast). This is what Simon had to say about this amazing experience.